Artist Judyth Greenburgh pops a large green marble into a wire catch at the end of a metal tube that resembles a pirate’s eyepiece. Robin Flinchum/Special to the Pahrump Valley Times A look at Mandalas by Darwin artist and author Kathy Goss. The Tecopa/Shoshone arts weekend is planned for later this month. 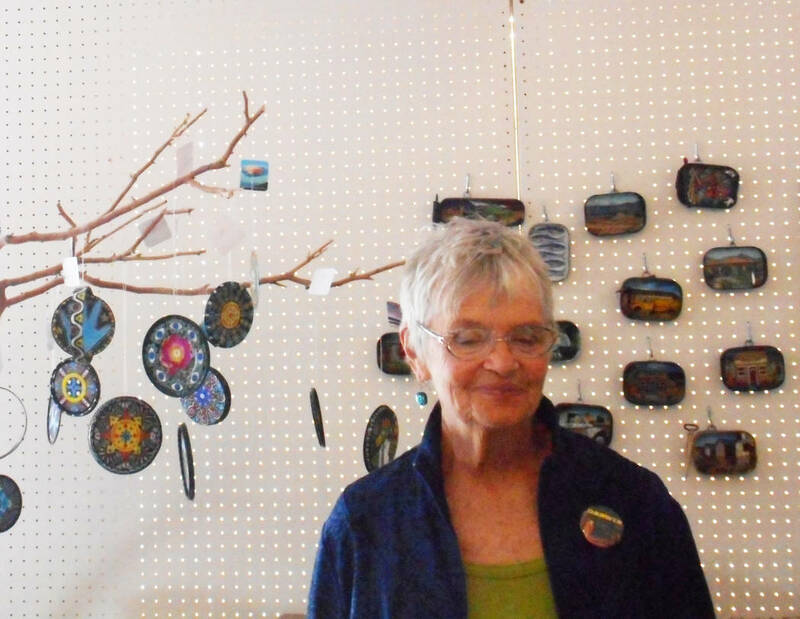 Robin Flinchum/Special to the Pahrump Valley Times Artist Judyth Greenburgh demonstrating one of her kaleidoscopes at the Tecopa Artists Group Gallery. Later this month is the Tecopa/Shoshone arts weekend. Robin Flinchum/Special to the Pahrump Valley Times Artist and author Kathy Goss is shown at the opening of the Darwin Art Emissaries show in Tecopa. 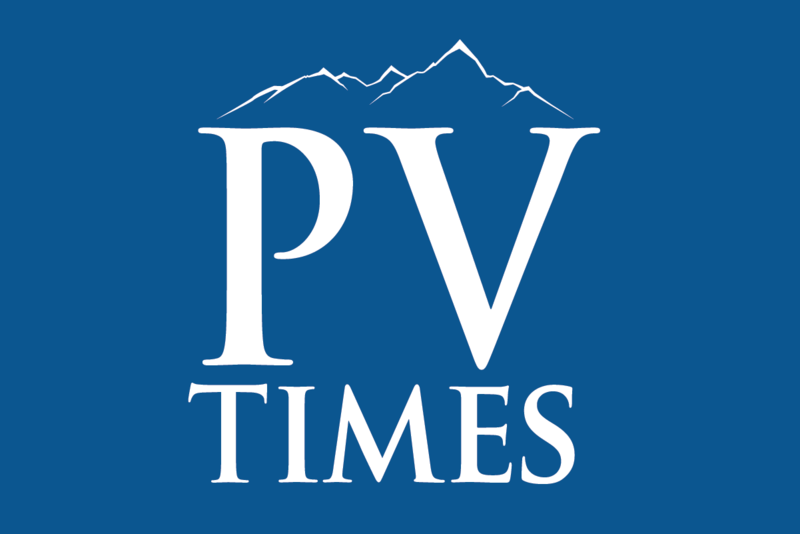 The Tecopa/Shoshone arts weekend is planned for later this month. Robin Flinchum/Special to the Pahrump Valley Times The Rustyscope, a working diorama/kaleidoscope by Judyth Greenburgh at the Darwin Art show in Tecopa. Multiple art-related works are available for visitors to see. 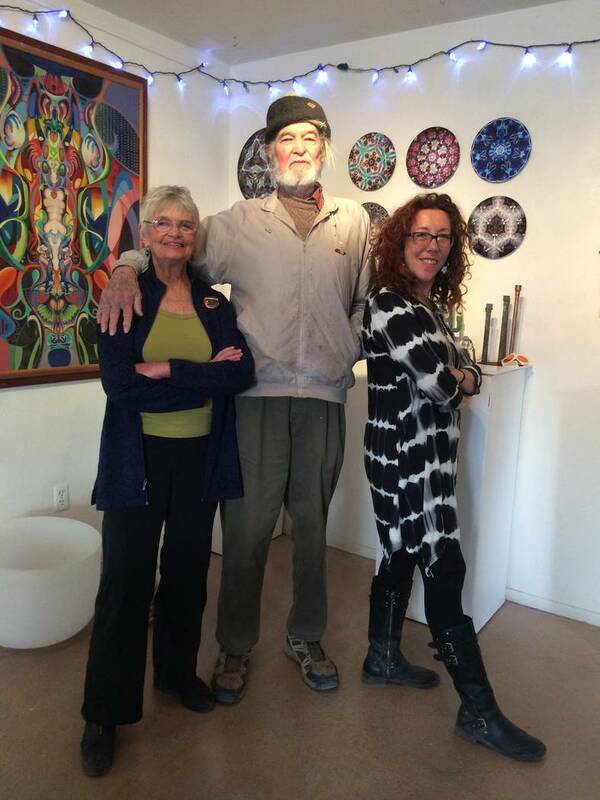 Amy Noel /Special to the Pahrump Valley Times Kathy Goss, left, John Hamilton, center, and Judyth Greenburgh, right, at the Tecopa Artist Group Gallery on January 20, 2018. Courtesy of Amy Noel A look at the promotional flyer for the Darwin Emissaries show. 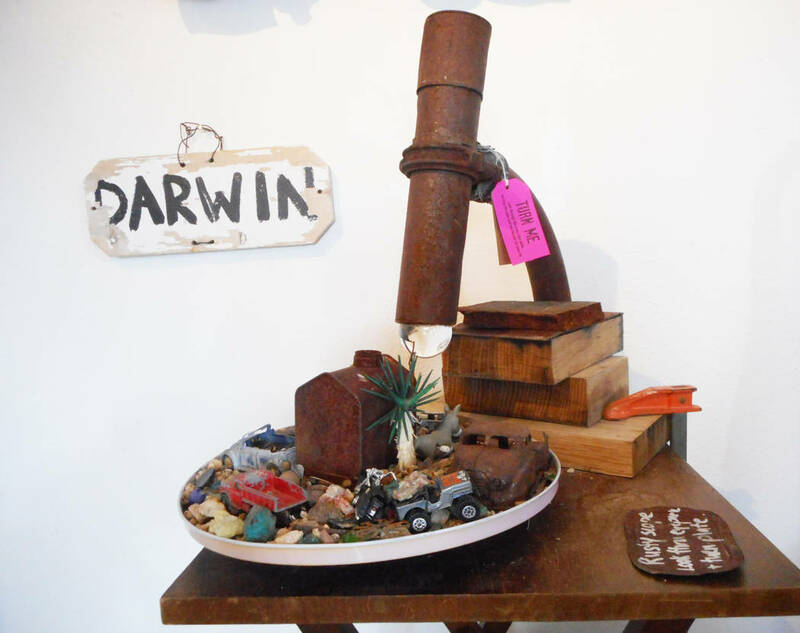 "Art Emissaries: Darwin Comes to Tecopa continues through March. She holds it up to the light. “Have a look,” she says, and then changes the green marble for a clear one, completely altering the effect of the kaleidoscope inside. 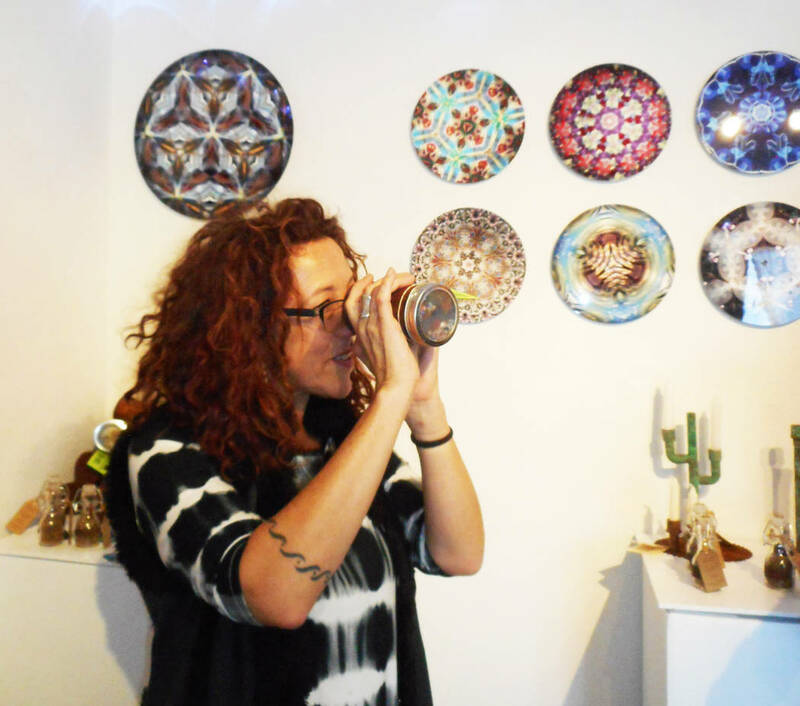 Standing in the small Tecopa Artists Group Gallery last month, she is surrounded by an astounding array of these devices—a kaleidoscope of kaleidoscopes, all of her own creation. 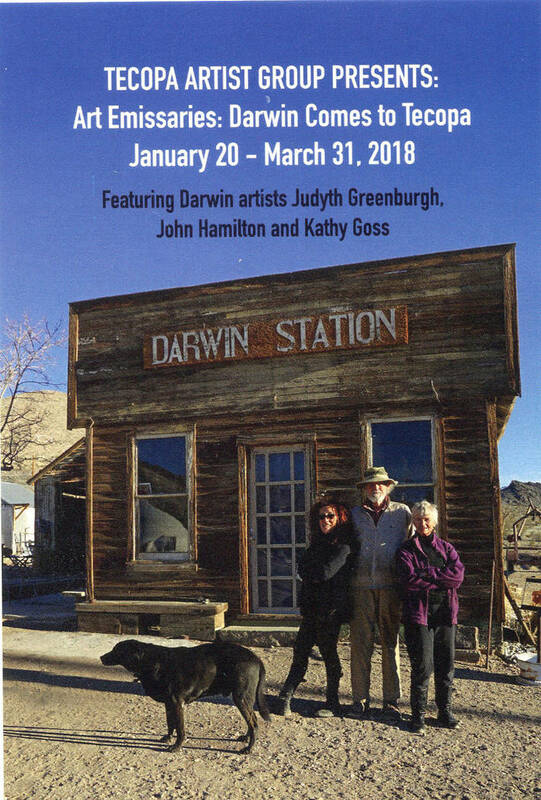 Greenburgh is one of three “art emissaries” who’ve come from the ghost town of Darwin, 150 miles away over the Panamint Range and west of Death Valley National Park, to show their works in Tecopa. The new exhibit, which debuted on Jan. 20, displays both mixed media and traditional work, including vibrant and colorful abstract paintings, realistic landscapes, an unusual memoir and tiny works of art on salvaged tin. The centerpieces of the show are large abstract paintings by 87-year-old artist John Emmett Hamilton, originally from Texas, who worked as a professional illustrator before he retired to travel the country in a camper. Flanking Hamilton’s work is an extraordinary array of small art pieces largely created from rusted metal artifacts gathered in the old ghost town. 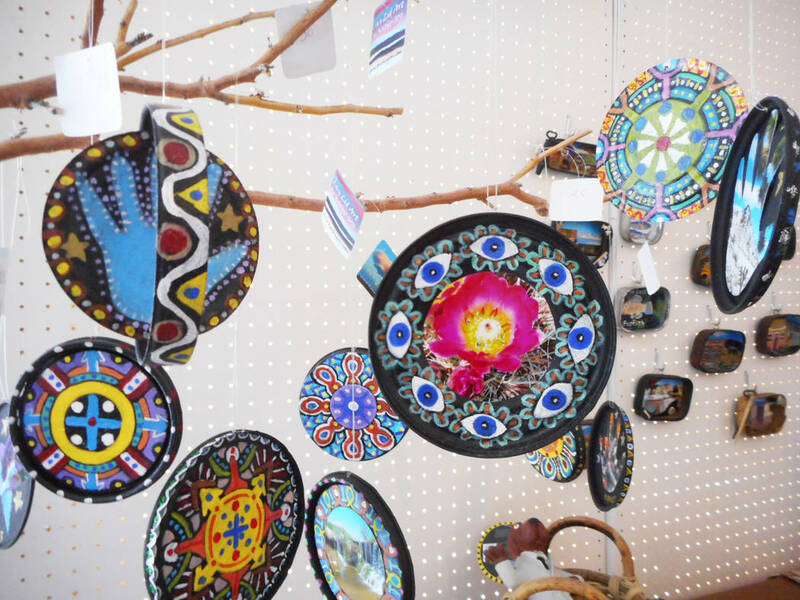 Artist and author Kathy Goss’ display is comprised of tiny works painted or collaged inside weathered sardine cans, along with mandalas and other designs painted on tin can lids. Goss’ best-known work of art is her book “Darwoon Dyreez”, an unusual fictional memoir written in an entirely phonetic dialect that Goss created herself. “If you were taught to read phonetically you probably won’t have any problem with it but it’s difficult for some people,” Goss said of the learning curve required to read her book. It makes the reader slow down and truly take in the story, she said. Greenburgh, a transplanted Londoner, makes kaleidoscopes in many shapes and sizes. Old flashlights, tin cans, shotgun shells, anything round and tubular, said Greenburgh, can be made into a kaleidoscope. She demonstrates her work with enthusiasm, showing how some require a shake, others require the viewer to turn the marble ingeniously fitted into the end. All three of the artists live in Darwin, which in the last couple of decades has been enjoying a modest renaissance as an art community, Goss said. The town has an official population of 36, and people tend to keep to themselves while working on their creative projects, said Goss. However, she added, there is a community center where they meet for potluck dinners and other social events. Hamilton gave up his “ancient” camper, he said, many years ago to take over a job as caretaker at the mine works above Darwin. Then he moved down into the town where, he said, he has a comfortable house, good food to eat, and three fine cats for company. Some mornings, Hamilton said, he has a paintbrush in his hand before he even has breakfast and he can work as long as the inspiration lasts. Hamilton’s landscape paintings were his bread and butter for many years he said. The largest piece in the show is an abstract called “Seven Charas in the Language of Symmetry” Hamilton painted in 1967. It is complemented by an abstract he said he finished a mere few weeks ago. Many of his landscapes are also on display. Darwin is rich in mining history and ghost town lore, which provided not only material for Goss’ book, but tangible relics for the artists to repurpose. Greenburgh’s main showpiece is called the “Rusty-scope” and made of scavenged artifacts assembled to look like a large microscope. Through the eyepiece, the viewer sees a diorama of miniatures both gathered in and representative of the town of Darwin. The diorama rotates lazy-susan style under the viewfinder, creating a kaleidoscope effect. Goss and Greenburgh will be hosting workshops at the resort in February to show more of how and why they make their art. Robin Flinchum is the author of “Red Light Women of Death Valley” and lives in Tecopa. Megan Edwards, Author of “Full Service Blonde” reading and book signing at Shoshone Museum (free) 1:30 p.m.
Kathy Goss, Author of “Darwoon Dyreez”, talk and workshop, Tecopa Gallery (free) 2 p.m. -4 p.m. The exhibit runs through March 31 and is free to the public. 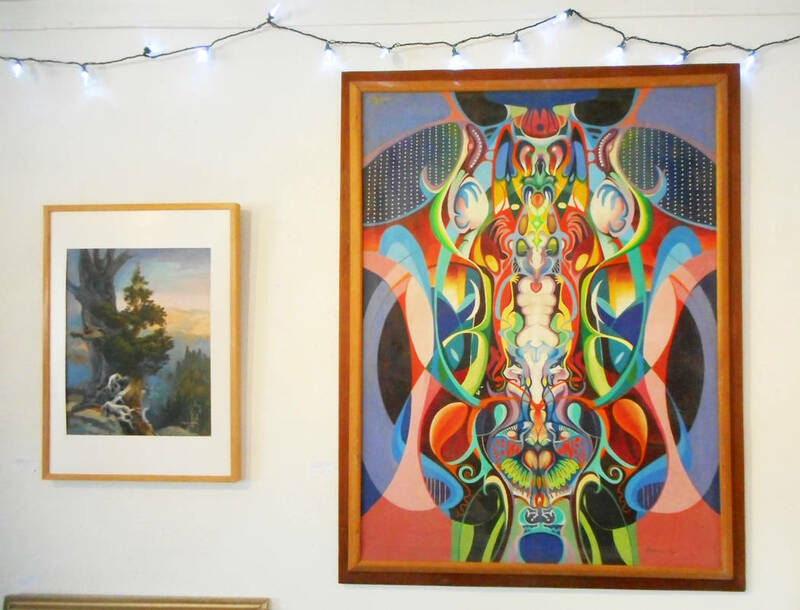 The gallery, housed in the lobby of the Tecopa Hot Springs Resort, is usually open daily from 12 p.m. – 5 p.m. Call before you go 760-852-4420.